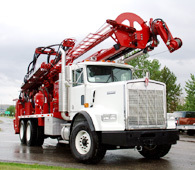 Water Well Drilling, Polson Montana – Allwest Drilling Inc. Most all rural water for private homes comes from a well. The well is by far the most important part of the building process and in it is the first step in building your home. A home isn’t much without a reliable and clean source of water supporting it. At Allwest Drilling in Polson Montana we strive to deliver the best possible water well. With hundreds of satisfied water well customers in and around Polson Montana. Our customer service upholds the highest standards. When you work with Allwest Drilling you know you are dealing with an owner and not a salesman. Allwest Water Well Drilling can assist with the complete design and installation of your water system. We make every effort to insure that the well placement meets the minimum set back requirements for all state and local agencies to protect your new well from possible contaminates. We strive to provide our Polson water well customers with an abundant water source.